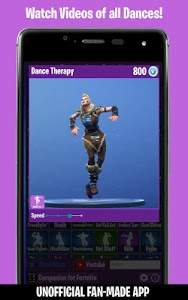 This App is unofficial, it is also Ad-Free for all time in order to comply with Epic's policy for Fan Content. 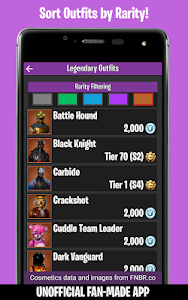 Get all the emotes and cosmetics on your phone right now! The cosmetics are from the real game. ★Watch videos in slow-motion or high speed (Android 6 or above). In order for the Shop to work and to get updated cosmetics lists the device has to be connected to the internet. 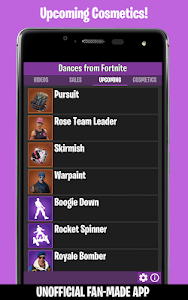 Missing Fortnite Dance/Emote videos are added post-release via a in-app downloading system that also requires an internet connection in order to add new videos. This App is and will always be Ad-Free. 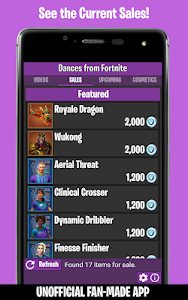 This App has been confirmed by the Fortnite/Epic legal team to seem compliant with the policy. 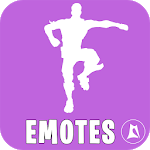 - Added Leaked Emote links to Youtube from the App. 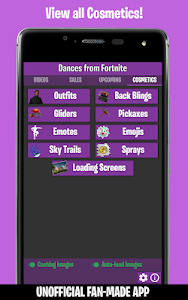 - Youtube video support for non-emotes such as gliders, outfits, contrails etc. We are adding videos to the video database over time! - Replaced and re-sampled videos as well as making sure all videos are bundled from start. 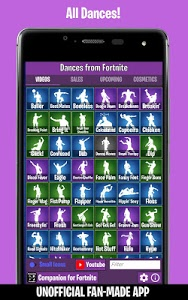 Similar to "Dances from Fortnite (Ad-Free)"